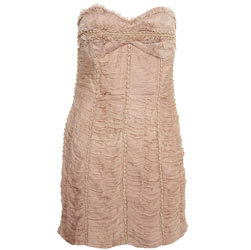 For example this pink dress is very pretty, and quite unusual- but £120?!?! I don't think so. I like this cardigan very much, the heart details are cute and I love slouchy cardigans. It's £45 which isn't too bad as my Urban Outfitters slouchy cardigan was about that much. So I'll let this one pass! May even buy it if it's still available after my hols. The tops are all a bit boring. Quite nice prints, but over expensive, and not looking particularly warm for winter. Kate Moss may be able to taxi it everywhere, but I have to wait around for buses. 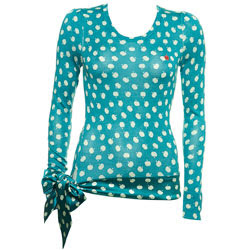 I quite like the print of this apple top but it looks a bit thin and not worth £45. The trousers are all boring, there are no decent winter coats and there don't seem to be any bags or shoes as yet. My main problem with the Kate Moss stuff is the quality. I bought a dress and a tshirt from the first collection, which are both pretty but were expensive and rubbish material. And expensive. Ha I'm sure I'm not the only person to walk into their favourite shop and somehow come out with a full bag and empty purse! Im not sure what 'type' of person I am though! Wow, i really like the dress and the cardigan...so lovely! Nice blog you have, i'll definitely be back! Mila and Sunniva I am so glad you feel the same! I have been trying to work out how much I would be prepared to pay for it. I think maybe 90 would be reasonable because of the Kate Moss name, but without it, 60 maybe? It depends on the quality and the details. I'm tempted to go and try it on tomorrow just to see if it's worth the price! OMG THAT CARDIGAN [NAVY] IS AMAZING! I WANT IT! belle.chantell- boo poor you! I pity you!